Whether you are searching for the perfect giveaway for your gym or your organization is hosting a local meet, you can find just the right custom leotards at Garland Activewear. We offer a wide selection of stunning custom leotards that are just perfect for your upcoming event. Our custom leotards can be fully personalized according to your preferences with different styles, fabrics, and colors. We also offer many different options for embellishments including rhinestones, sequins, studs, heat transfer, and screen printed designs. Information and gallery of our full line of custom design competition leotards. All leotards are completely customizable with your choice of colors, fabrics and embellishments. Information and gallery of our value priced Competition leotards, perfect for Levels 2-4 and Xcel! Leotards are customizable to your choice of colors and fabrics. Prices start at only $50. Interested in custom workout leotards for your team? Click here to view our wide range of workout leotard silhouettes to choose from. All leotards are completely customizable with your choice of colors, fabrics and embellishments. Are you hosting a meet or event and looking for the perfect giveaway? A custom Garland Activewear meet leotards are the perfect choice to increase participation and outfit your athletes! 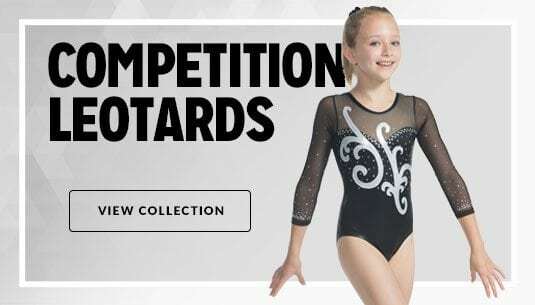 At Garland Activewear, we are known for our exceptional gymnastics leotards that are perfect for both training and competing. Our girls gymnastics leotards are made durably so that they your team can perform at their very best. When you need quality gymnastics clothing that is made for maximum movability, there is no need to look anywhere else. Our prices are affordable and start at just $12.75. Browse our selection to see what styles, colors, and fabrics we have available for you to choose. With custom meet leotards, you can effectively promote your event or organization for an affordable cost. We can fully customize each leotard according to your specific preferences. You can be sure that you’ll receive a quality leotard that looks and functions great. Consider Garland Activewear for the best gymnastics clothing available online. Give us a call to get started with your order for custom leotards today. Placing your order with Garland Activewear is simple and easy. Simply fill out the contact form or get in touch with us by calling 1(877) 427-5263 today.